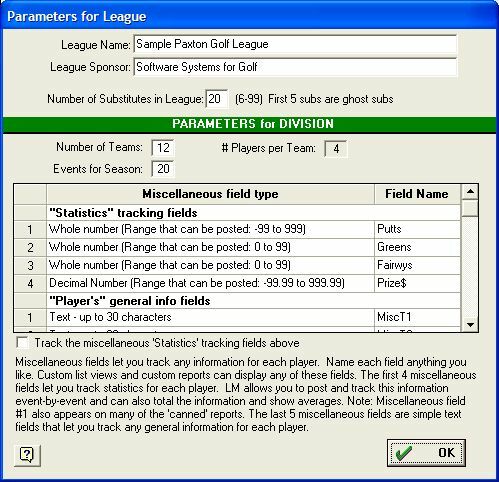 League Manager has nine distinct miscellaneous fields for your use. Miscellaneous fields let you track any information for each player. Name each miscellaneous field anything you like. Custom list views and custom reports can display any of these miscellaneous fields. You can sort or filter (select a group) players on custom reports and views using miscellaneous fields. Miscellaneous Field #1 already appears on many of the reports that came with the software. Tip: If you want to track any of the first four miscellaneous fields - the "statistics tracking fields" - then make sure to put a check mark where it says "Track the miscellaneous 'Statistics' tracking fields above."